There is a saying that used to be shared in history circles, with a wry smirk, which has since become a minor cliche: “History is written by the winners”. Hackneyed though it may be, there is a great deal of truth in that old platitude. Be it in politics or in motorsports, odds are the story you know is the one that has been informed by the success of those who came out ahead. In the case of DKW and their series of once-dominant supercharged motorcycles, the company's successes have been drowned out by the tides of history. Some of the fastest, most advanced, and technologically interesting two-strokes of the 1930s have nearly been forgotten due to the company's unfortunate national ties – the once-famous Ladepumpe and supercharged “Deeks” became victims of historical circumstances beyond their control. The DKW story begins in 1916 when Danish engineer Jørgen Skafte Rasmussen founded the company in Zschopau, Germany. At this early stage Rasmussen was producing steam machinery fittings, the latest of several industrial business ventures he had worked on since immigrating to Germany in 1904. The resource shortages and rationing experienced in Germany during the First World War had inspired Rasmussen to develop a steam-driven automobile as a more economical alternative to gasoline-powered machines, hence the company's name: Dampf Kraft Wagen, the "steam motor vehicle". While the steam car venture failed to take off, the fledgling company found success in an unlikely avenue: a tiny, high-quality 18cc two-stroke stationary engine designed by engineer Hugo Ruppe. Des Knaben Wunsch, as it became known, was sold as a toy engine and soon took the place of miniature steam engines on the tabletops of well-to-do children across Germany. 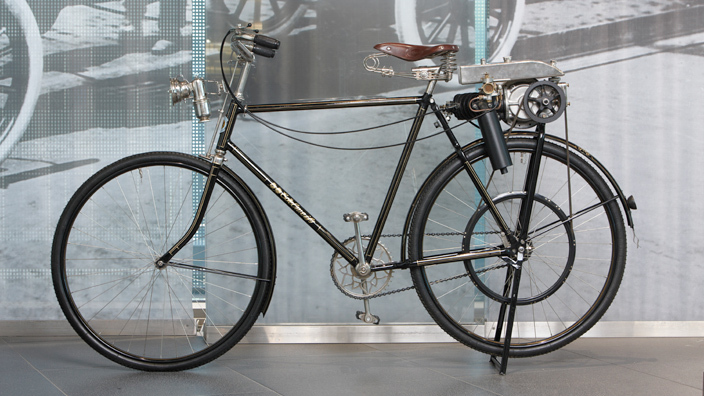 DKW entered the two-wheeled fray in 1921 with another Ruppe design, this time a 118cc two-stroke auxiliary engine that could be installed on a bicycle. This humble machine was dubbed Das Kleine Wunder, once again preserving the DKW moniker despite the change of tact and presumably allowing Rasmussen to re-use the company letterhead. It wasn't long after this tentative first step into the two-wheeled marketplace that DKW built its first complete motorcycle, the 142cc Reichsfahrmodell of 1922. The timing proved to be fortuitous as the company was able to ride the wave of newfound popularity for inexpensive two-wheeled transportation following Germany's bout with extreme inflation in the early 1920s. 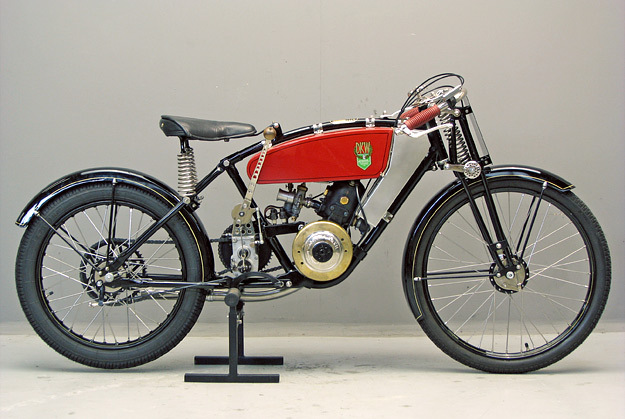 Such was the success of DKW motorcycles that by 1928 Rasmussen purchased a controlling stake in a little automotive manufacturer by the name of Audi Werk AG in Zwickau. The Zwickau factory would subsequently became the site of DKW automobile production, while motorcycle manufacturing continued at Zschopau. 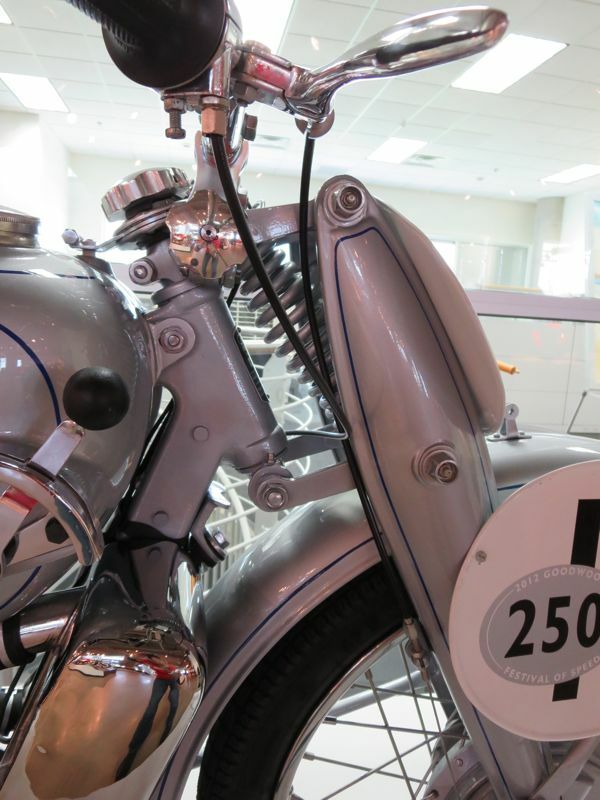 By the early 1930s DKW was one of the world's largest motorcycle manufacturers with over 20,000 employees. Two-strokes remained the company's speciality, and DKW became well regarded as a manufacturer of high-quality 'strokers in both two- and four-wheeled applications – it seems unusual today, with four-stroke automotive engines having been the norm for the latter half of the 20th century, but there was once a time when you could find smoky ring-ding mills under the hood of a variety of cars competing with their (admittedly heavier and more complicated) four-stroke counterparts. 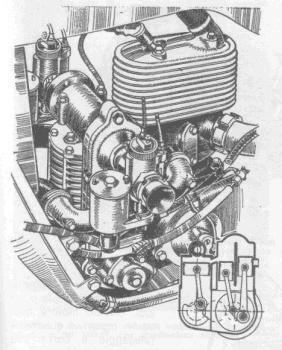 Through the 1930s DKW produced a series of fascinating forced-induction two-stroke V4s that used a pair of integrated cylinders to pressurize the intake charge – the resulting motor appeared to be a V6 but only had four “functional” cylinders, the extra pair of pistons serving as compressors. With their explosive growth at the end of the 1920s checked by massive debt and the beginning of the Great Depression, DKW needed to re-organize to remain solvent. The solution came in 1932 when DKW and Audi were merged into Auto Union along with Horch and Wanderer. The current four-ring logo used by Audi was the symbol of Auto Union, each ring representing the four manufacturers. Success in two-wheeled endeavours inevitably results in competition, and DKW was quick to begin producing racing machines to compete in small-displacement categories. During those early days of racing DKW encountered a formidable competitor from rival German marque Bekamo, who produced a series of highly refined two-stroke singles that became famous for being the first "supercharged" production motorcycle. They were designed by (drumroll) Hugo Ruppe – the same Ruppe who had designed Des Knaben Wunsch and Das Kleine Wunder before leaving DKW to found Berliner Kleinmotoren Aktiengesellschaft (Bekamo) in 1922. 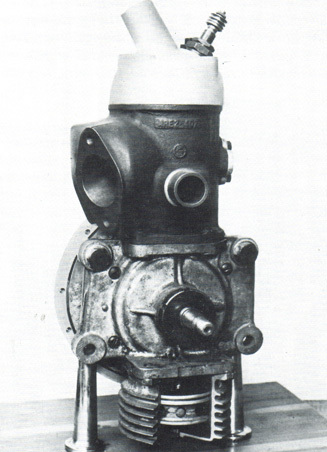 The Bekamo piston-port 129cc single used a dummy piston and cylinder that was placed opposite the functional piston at the base of the crankcase. It appeared to be an asymmetrical flat twin at first glance but the supercharging cylinder, dubbed the Ladepumpe (charging pump), had no porting or spark plug. The engine operated on the Bichrome supercharging principle where the swept volume of the crankcase was reduced as the supercharging piston moved up, thereby compressing the intake mix as it swirled through the crankcase. The piston doesn't compress air directly, it dynamically reduces the volume of the crankcase as the intake port opens. 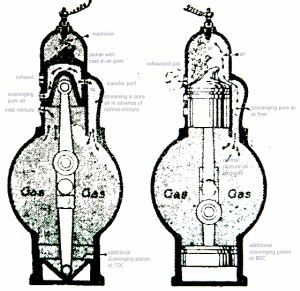 The upward movement of the pumping piston was timed to match the downstroke of the main cylinder so it compressed the intake mixture just as the port opened, forcing the charge into the cylinder. This is an effect that is only possible in a two-stroke, where the crankcase serves as the intake plenum. 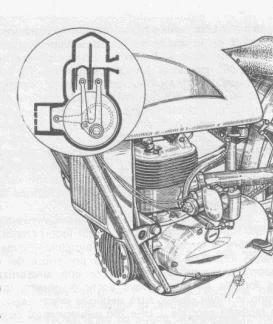 The deflector of the piston-port design angled the intake charge upward into the combustion chamber, preventing the pressurized mixture from being blown straight out of the open exhaust port on the opposite side of the cylinder (a problem called "overscavenging" in two-stroke parlance). The Bekamo also featured a novel adjustable air-assisted scavenging system where an extra port fed fresh air into a chamber inside the piston, after which it would be fed into the cylinder to help push exhaust gas out before the fuel mixture entered. DKW began developing their own Ladepumpe engine designs, resulting in the liquid-cooled 175 ARe and 250 ORe singles and the 500 PRe twin in 1928. 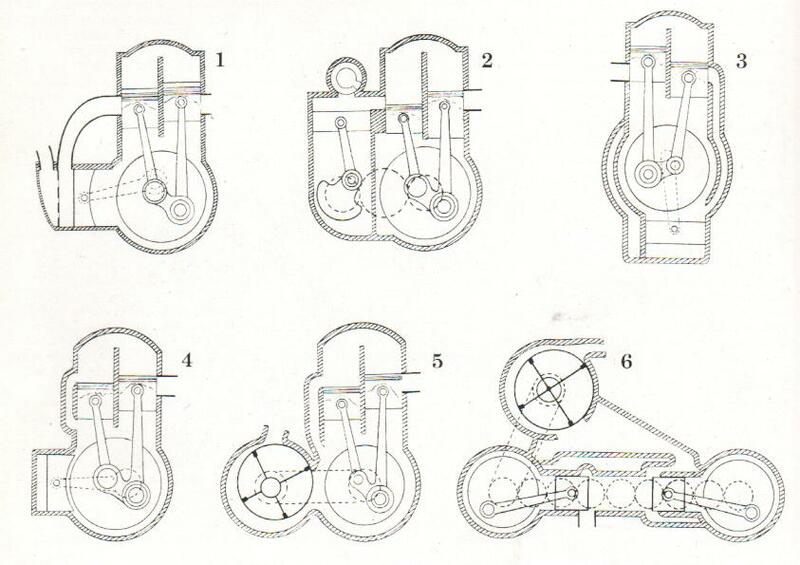 These were similar in principle to the Bekamo, using piston-port induction and featuring the same layout with a Ladepumpe cylinder set 180 degrees opposite the functional piston(s). These early machines achieved some successes and had a significant performance advantage, albeit at the expense of fuel economy. The ARe and ORe advanced the DKW racing effort and proved to the be the first of a series of supercharged two-strokes that would become a signature of the marque in the 1930s. Around the same time that DKW and Bekamo were experimenting with their Ladepumpe engines, German engineer Adolf Schnürle introduced a revolutionary new porting design while working on two-stroke marine diesel engines. Where previous piston-port engines used a deflector cast into the dome of the piston to angle the charge upward and prevent overscavenging, the Schnürle porting used carefully angled ports that would direct the charge upwards into the combustion chamber. Because the scavenging was controlled by the porting and not the shape of the piston, a lighter and less heat-soak prone flat-top piston could be used, which allowed the use of higher compression ratios. DKW was the first company to adopt Schnürle principles in a production motorcycle engine, purchasing the rights to apply the technology to gasoline engines in 1932. 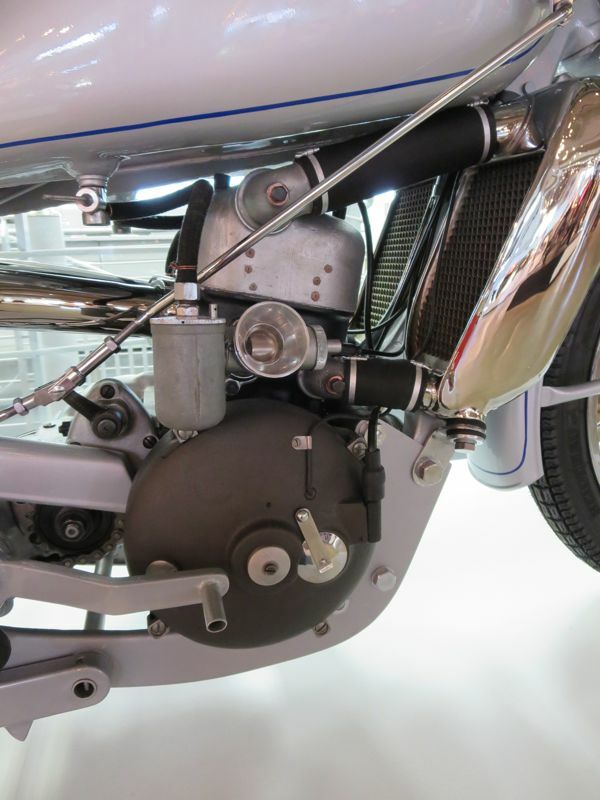 Schnürle porting, when combined with carefully tuned exhaust expansion chambers, would prove to be the most efficient two-stroke scavenging principle and one that would dominate two-stroke design right into the present day. 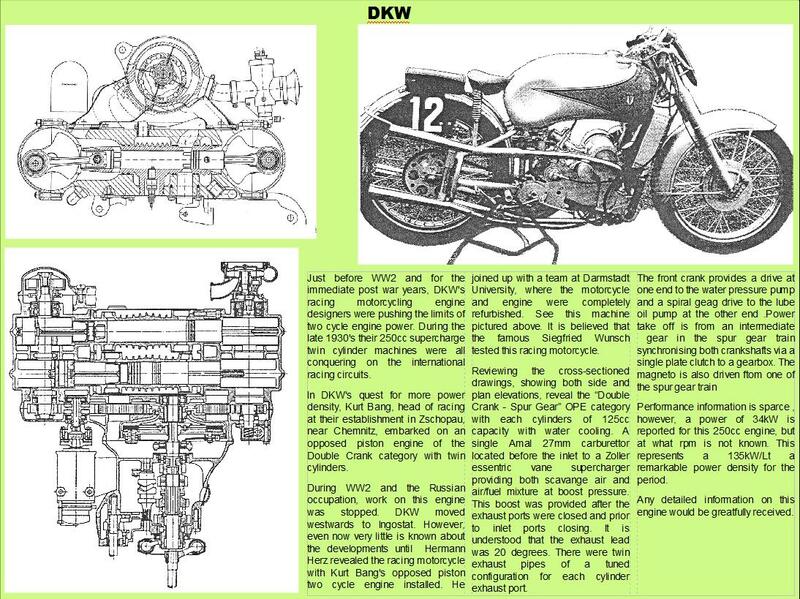 However in these early days DKW continued to focus on supercharged designs to improve the performance of their Rennmaschinen and make the humble two-stroke a formidable competitor against the four-stroke designs that dominated the European racing scene of the 1930s. This was a time when the four-stroke single was the king of European circuits, when big thumpers from the British and Italian brands were the machines to beat on the track. 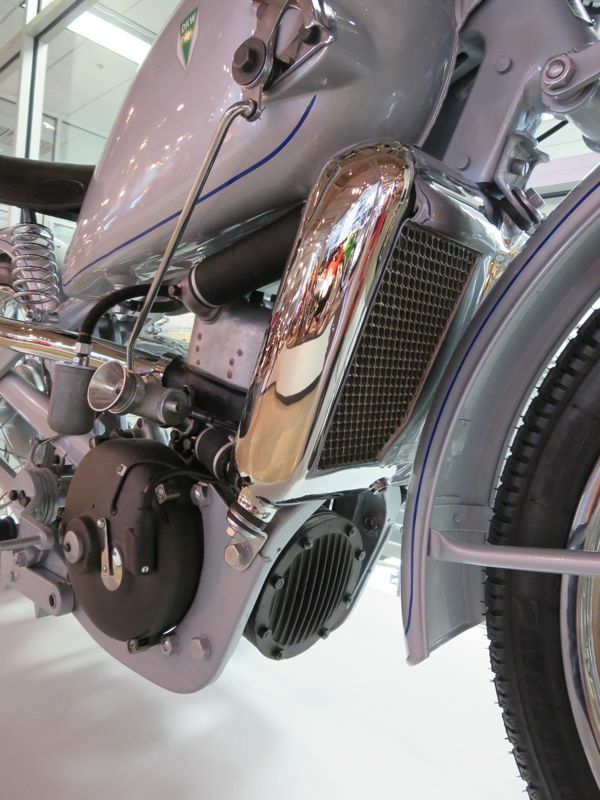 Multi-cylinder machines were just beginning to enter the scene and become competitive against the well-developed singles, but competitive two-strokes were virtually nonexistent in the larger categories. This was a time when the two-stroke was considered noisy, smelly and cheap – they were dirty, smoky engines better suited for lowly commuter machines than they were for fast sporting bikes. In terms of supercharging, Schnürle designs were at a disadvantage. Because of the flat piston and port-controlled scavenging, boosting a Schnürle engine simply resulted in significant overscavenging – the pressurized intake mix just blew straight through the cylinder and out the open exhaust port. But piston port designs, while better at handling boost, were limited in their efficiency and were hitting a wall when it came to tuning. DKW needed to take a step forward to remain competitive while continuing their supercharged racing programme. 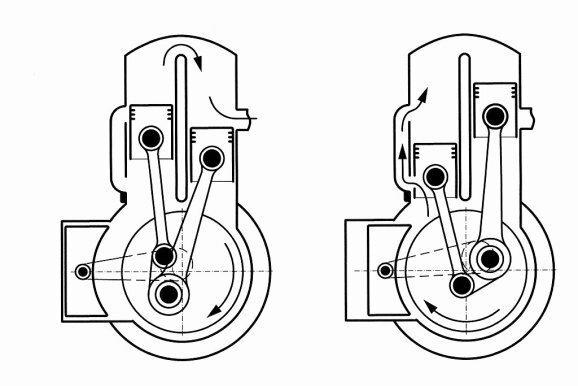 With piston-port being old hat and Schnürle designs still in their infancy, they turned to a third way: the split piston design. Split piston two-strokes were not a new idea. 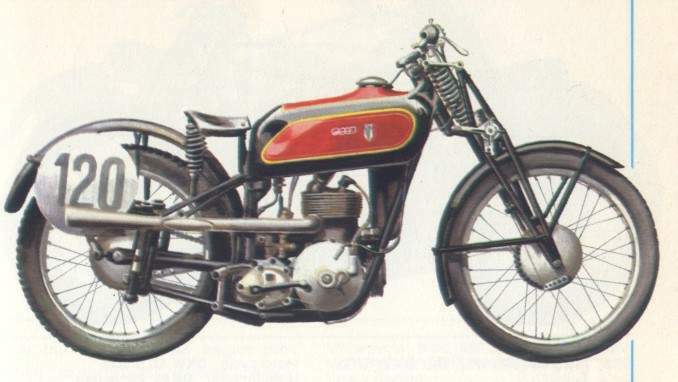 Garelli introduced the concept in 1912, and Puch had been building simple split-single engines (sometimes referred to as “Twingles” after they were marketed under that name by Sears in the 1950s) since 1923. Puch in fact won the 1931 German Grand Prix at the Nurburgring with a liquid-cooled and supercharged 250cc split-single ridden by Swiss rider Elvetio Toricelli, something that may have been a significant influence on DKW's subsequent racing programme. The basic principle of a split-piston engine is to separate the intake and exhaust ports by using two distinct cylinders with their own pistons, rising and falling in unison and sharing a common combustion chamber. The intake ports are cut into one cylinder, the exhaust ports into the other. The fuel mixture is pulled into the first cylinder and compressed into the bathtub-shaped combustion chamber. After ignition, on the power stroke, the exhaust is pulled out through the second cylinder and the process starts anew. Because there is only one combustion chamber and the intake and exhaust as split between the two cylinders, the split design is considered a single unit for racing purposes, the displacement calculated by combining the bore and stroke of each cylinder. 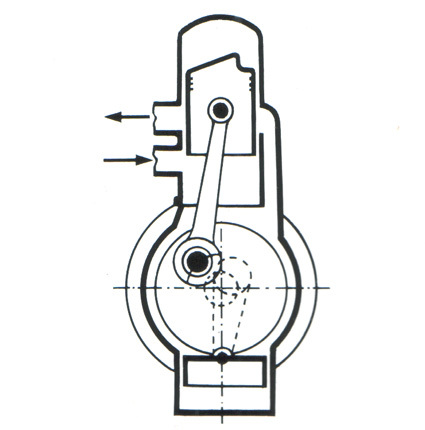 Two pistons were thus considered equal to a single cylinder of equivalent displacement. The Puch design, a later version of which would become somewhat famous in the post-war period when it was rebadged and sold in the USA under the Allstate brand by Sears, used a U-shaped forked conrod with a single crankpin controlling both pistons. 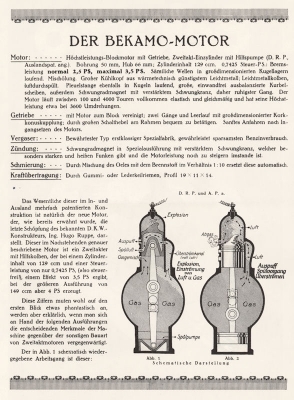 It was a curious but not particularly efficient design: while it was an improvement over the old piston-port engines, the added complexity and weight of the dual-piston setup and circuitous scavenging arrangement making it less efficient than the much simpler Schnürle design. But for DKW it had a distinct advantage: you could supercharge it without blowing the intake mixture straight out the exhaust. 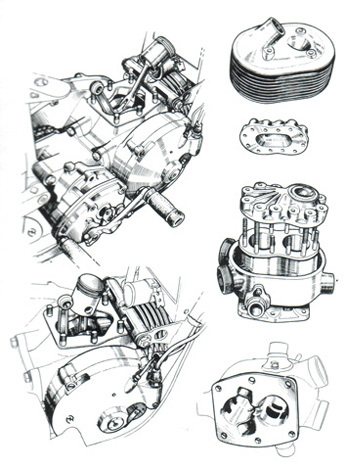 The Puch U-shaped conrod was heavy and unsuitable for the sustained high revolutions expected of a racing engine, so in 1931 DKW engineer Arnold Zoller refined the concept with a master/slave conrod design. There was a single crankpin for both rods, with the exhaust piston connected directly to the crankpin by the “master” rod, while the intake side piston was controlled by a “slave” conrod. The slave rod was offset slightly and connected to the main rod with a pivoting pin. The timing between the two cylinders was offset by about 15 degrees to close the exhaust ports ahead of the intake, to maximize the supercharger effect and preventing overscavenging. 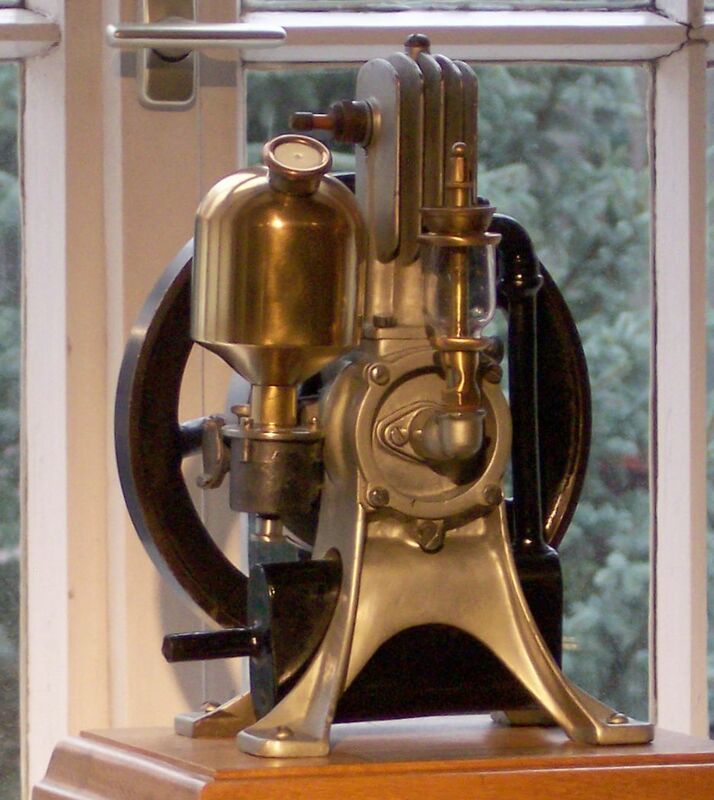 The first of the Zoller-designed machines was the URe, which was a thermosyphon liquid-cooled “single” with three pistons. The URe was supercharged with a massive 120mm-diameter Ladepumpe piston, driven off the crankshaft by two conrods, mounted at 90 degrees to the main cylinders and protruding out of the front of the crankcase between the downtubes of the frame. The bore of each of the split-single's pistons were the same (47.5mm), but the strokes were slightly different - 69.7mm and 70.5mm. Total displacement was 248.4cc and power was in the neighbourhood of 24hp at 4500 rpm, later revised to 30hp at 5000 rpm. A separate four-speed transmission was used with a chain final drive. The prototype chassis featured a duplex cradle steel frame with rigid rear suspension. Subsequent versions added a swinging-arm rear suspension suspended by a sprung hub with a separate hydraulic damper (despite looking much like a plunger rear suspension, it is in fact a full swinging arm). Experiments were made with a unique front suspension that used a girder fork sprung with three massive rubber straps instead of springs – yes, a rubber band suspension on a racing machine. Aside from the suspension experiments the chassis was very conventional and not particularly noteworthy. Some accounts point out that handling was always the DKW's weak point, and in general they were heavier than their competitors - problems that were overcome by the application of copious amounts of horsepower from their supercharged mills. Offered alongside the URe in 1935 was the SS 250, a production racer offered to the public at the cost of 1550 Reichsmarks. The SS was supposedly sold to the public at a loss and early versions were painted in the same silver and grey paint scheme as the works URe racers, albeit with simpler rigid rear suspension chassis with pressed steel downtubes until a 1938 update offered the same chassis design as the factory machines. That same year the silver paint scheme became reserved for the factory machines, with all privateer-bound SSs being painted black with red accents – supposedly this was to better distinguish privateer entries from works machines on the track, where the highly-competitive DKWs were becoming a common sight. 1938 saw the release of the UL, an updated 250cc machine that moved the Ladepumpe in front of the cylinder, inline with the engine and operating on its own crankshaft that was geared off the main unit. Two versions were developed which differed in their induction systems: the ULd featured a rotary valve while the ULe used a reed valve. Both were supercharged directly with the Ladepumpe force-feeding the intake ports. Power was now 35 hp at 7000 rpm, top speed 110 miles per hour. These machines were an unusual sight, with twin Amal carburettors jutting out either side of the motor ahead of the main cylinder, with the twin high-mounted exhaust pipes (being nothing more than long and unmuffled megaphones) exiting at the rear. Legend has it that the side-mounted carburettors made wet weather races a challenge, with rain water easily getting sucked down the unfiltered intake trumpets. 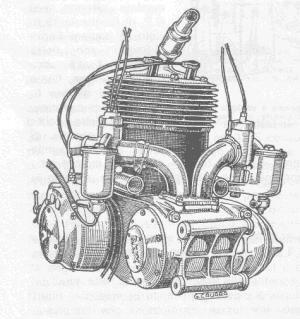 For larger capacity classes a twin cylinder version of the UL was developed, and these motors were available in 350, 500, 600 and 700cc displacements, with the three latter capacities (some with multiple Ladepumpe pistons) reserved for sidecar racing. Unlike the ULe and ULd 250, the Ladepumpe was once again moved to the 180 degree position and driven off the main crankshaft with a pair of conrods. Thus these “twins” had five pistons: four 39.5mm items, plus the 100mm supercharging piston, all held together around a common crankshaft by six conrods. 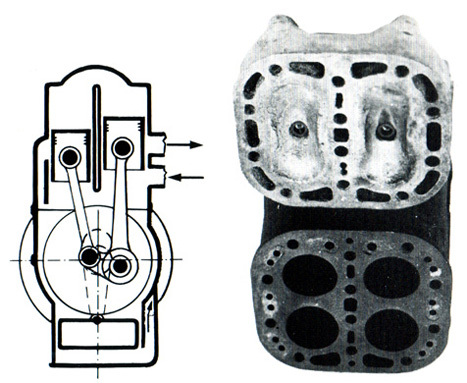 The cylinder block had the appearance of a square-four, and were distinguished from the 250s by their finned water jackets and the 180 degree placement of their Ladepumpe cylinders. 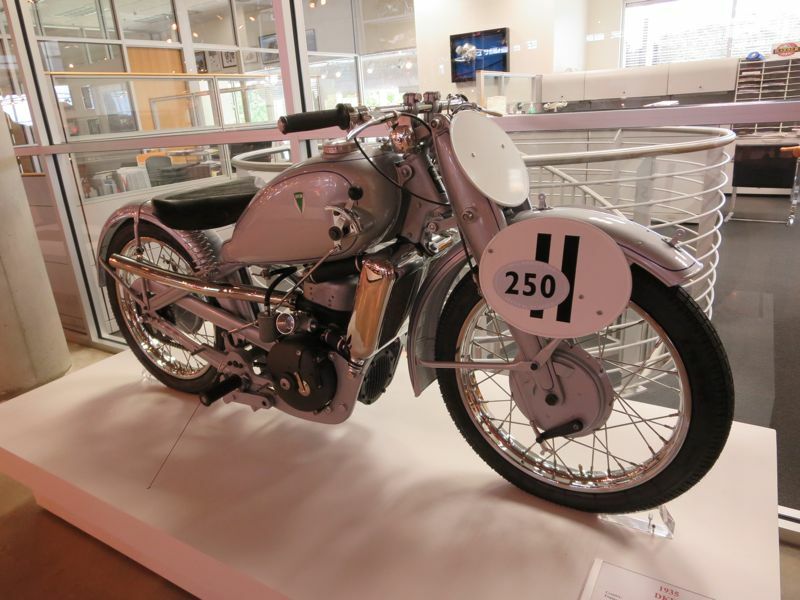 A SS 350, which was virtually identical to the works UL machines, was offered to the public and sold in limited numbers. It was the 250 ULd that served as the mount for one of DKW's most famous victories at the 1938 Isle of Man Tourist Trophy. It was not the first time the Deeks had been fielded at the venerable TT; the factory had been participating with their supercharged machines since 1935, and had taken third place in the 250cc Lightweight category in 1936 and 1937. The DKW team was a formidable force, one of the best organized works efforts at the time with a racing department that exceeded 100 staff members. It was no secret that the DKW team was part of the Nazi push to dominate motorsports across the continent, a pet project of Hitler and the Nazi party to prove the supremacy of German technology in every category. Riders and team members often held positions in the National Socialist Motor Corps (Nationalsozialistische Kraftfahrkorps, NSKK), a curious offshoot of the Sturmabteilung that endured after the SA was violently purged in 1934. The NSKK was ostensibly a paramilitary organization, but was comparable to a motoring advocacy and training group in terms of its mandate. Imagine the AAA with a quasi-military structure and questionable political affiliations and a tank driver training program. In 1938 the DKW team returned to the Isle of Man with 29 year old Saxon rider Ewald Kluge, a fast rising star in the continental racing circuit who was on his way to becoming one of the top riders in Europe. Kluge meteoric rise was all the more surprising given his humble background and relatively recent entrance into motorsport. Kluge had endured a difficult childhood and the loss of his mother at a young age. He had a keen interest in two- and four-wheeled machines that he inherited from his father, and apprenticed with an automobile mechanic. Unfortunately his apprenticeship coincided with the severe German economic downturn and inflation of the 1920s, which forced Kluge into a career as a taxi driver in Dresden. He scrimped and saved for years before purchasing his first racing motorcycle in 1929, a British-built Dunelt single. Success came quickly for the young rider and by 1934 he had been hired by DKW was a race mechanic and back-up rider. His success with the DKW team began in 1935, when he rode with the DKW team at the International Six Days Trial and helped earn the German effort the top team prize of the event. Kluge was known for his smooth, precise and fast riding style that earned him the enviable nickname of “Panther”. From then on he was a formidable competitor in the German racing scene, joining the works DKW team in 1936 and dominating the German 250cc championship for the following four years. Kluge made his TT debut at the 1937 event riding a factory-backed 250 URe. He performed well, leading the Lightweight category for a period, but faced stiff competition from the Italian contingent. When a broken throttle cable sidelined Kluge, Moto-Guzzi rider Omobono Tenni became the first Continental European rider to win the Lightweight TT, 37 seconds ahead of the second place finisher Stanley Woods. In October of 1937 Auto Union prepared several modified, alcohol-burning versions of the URe singles and twins to contest several speed records. Kluge and teammate Walfried Winkler rode the highly tuned machines: the 250 produced 49 hp, while the 350 shrieked out 60 hp. 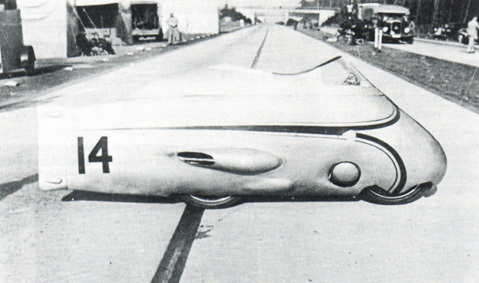 Special streamlined helmets and highly aerodynamic fairings were employed, the most impressive being a “sidecar” (minus the passenger accommodations) that featured a fully faired closed canopy. Speed runs were held on a stretch of autobahn between Frankfurt and Darmstadt, where Auto Union secured 14 class records with their alcohol-fueled DKWs. In 1938 Kluge and DKW returned to the Isle of Man with the new rotary-valve 250 ULd. Kluge set a commanding lead in the event, the thundering crackle of his megaphone-equipped machine becoming the stuff of legend – even today the Ladepumpe DKWs are remembered as some of the loudest machines to ever turn a wheel at the TT, and their staggeringly loud exhaust note could be heard some 10 miles away. In the decades since the 1938 event those pummelling exhaust pulses have been exaggerated somewhat - at some point over the years 10 miles became 20, then 30, 40, maybe 100 miles, the distance growing with each subsequent pint. Some grizzled old veterans share tall tales claiming the racket emanating from the German steeds could be heard clear across the Irish Sea on the British mainland. Whatever the reality, the Ladepumpe Deeks were spectacularly goddamned loud and still shatter eardrums around the world when the machines are dusted off and paraded around at classic events. Despite some spectacularly terrible fuel consumption (to the tune of around 15 miles to the gallon) and the associated fuel stops, the ULd dominated the field and Kluge won the Lightweight TT with a staggering eleven minute lead over the second place finisher, with a total time of 3 hours, 21 minutes and 56 seconds at an average speed of 78.48 miles per hour. He became the second continental European to win at the TT, and the victory became a feather in DKW's cap. 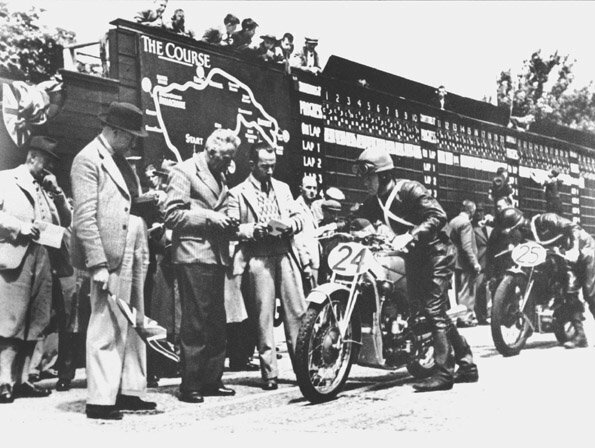 Kluge would go on to win 12 of the 14 races he entered in 1938, taking second in the remaining two, making him the European 250cc champion. At the end of the season he earned the title “Champion of Champions”, an accolade only given to riders who earned the highest possible number of points in European events. DKW's moment of glory in 1938 would quickly become overshadowed by the events of the following year at the so-called “Nazi TT” when state-sponsored German teams arrived on the Isle displaying none-too-subtle support for Hitler's government and a mandate of conquering the Manx event to showcase the supremacy of German motorsports efforts. The German contingent, represented by entries from BMW, DKW and NSU, would turn the 1939 TT into a political event that would leave a bad taste in the mouth of many who were involved. German riders had Nazi standards sewn onto their black leather outfits. Well-connected Nazi party faithful were present. The NSKK was in control of the scene, orchestrated by the organization's leader Erwin Kraus. It's not that surprising that in the decades since the Nazi TT (the nickname itself a derisive jab that downplays the entire event and the accomplishments of all involved) the British have developed a revisionist view of the event and the people who came to the Isle that June. This can take the form of trivialization or snide derision. The riders became sinister figures, described by one MCN summary as “stormtroopers in a paramilitary organisation run by the Nazi party” - that organization being the NSKK, the stormtrooper jab referring to the junior rank of the Corps (Sturmmann). The same summary refers to Ewald Kluge as an “assault leader”, referring to his rank as a mid-level lieutenant (Sturmführer) in the NSKK. * Much like any other scenario involving Nazi-era Germans exaggeration runs rampant and biases are reinforced by subsequent events in history. Revisionism is the rule rather than the exception. The German teams are dismissed as nothing more than dirty rotten Nazis who spoiled the TT for everyone. DKW continued to refine their supercharged machines for 1939. 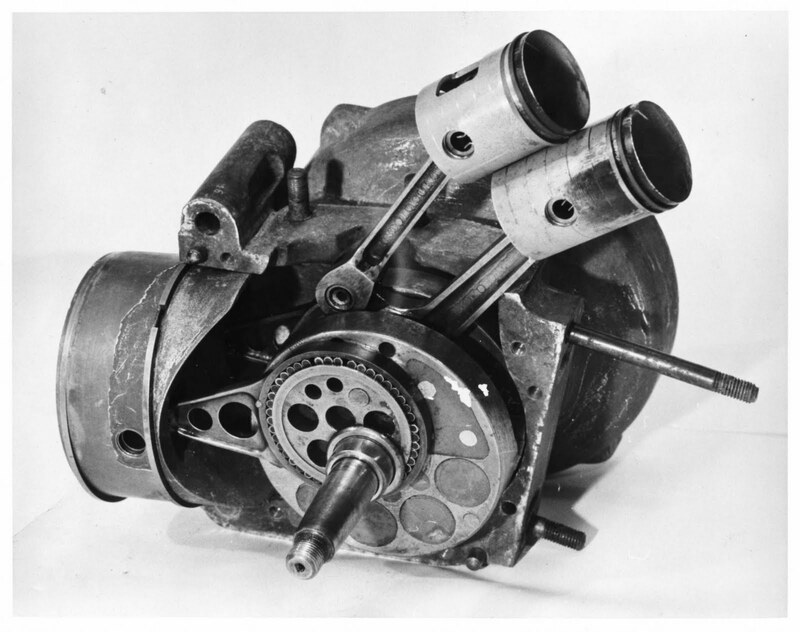 The ultimate evolution of the company's forced-induction split-single formula were the 250 and 350 US, which dispensed with the Ladepumpe in favour of a centrifugal supercharger mounted in front of the engine feeding pressurized mixture into the crankcases. Power was now up to 40 hp at 7000 rpm for the 250, 48 hp for the 350. Despite the death of BMW rider Karl Gall during practice, the German teams forged ahead and BMW took first and second place at the Senior TT, the first overall TT victory by a non-British machine. DKW performed well in the smaller categories but failed to secure a win, their efforts ultimately overshadowed by the high-profile Senior victories. 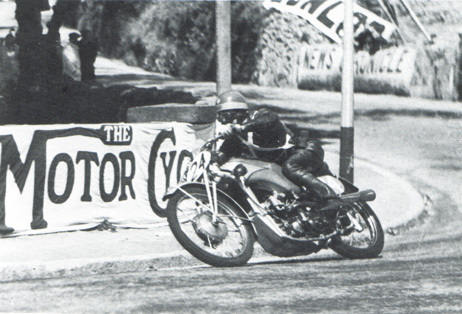 Ewald Kluge took second place in the Lightweight TT aboard the 250 US, finishing behind Benelli rider Ted Mellors. Siegfried Wünsche took fifth for the team in the same event, while British DKW rider Ernie Thomas placed eighth. Heiner Fleischmann took third and Wünsche sixth in the Junior category aboard their 350 USs. Georg Meir, winner of the Senior TT on the formidable 500cc BMW RS 255 Kompressor, infamously gave a one-armed Nazi salute on the podium. It was a perfect piece of propaganda for Hitler's Germany, a victory at the highest level of European competition. 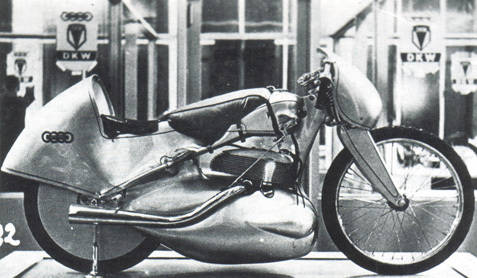 Subsequent history turned the 1939 TT into an embarrassing episode that was hoisted high as an example of Nazi hubris. The final insult was the loss of the Manx trophies given to the Axis teams which would be spirited away and lost until the end of the war. After some sleuthing the Lightweight trophy given to Benelli was dug up from under a chicken coop in Pisaro, while the Senior trophy was seized from a BMW distributor in Soviet-held Vienna. Once the war was underway and competition had been suspended, DKW shelved their racing programme to focus on wartime production of NZ 350 and RT 125 models for the Wehrmacht, which would become popular among dispatch and reconnaissance riders as lighter and nimbler alternatives to the four-stroke BMW and Zundapp military motorcycles. DKW would be one of many German companies to use forced labour during the war - this included at least 500 Jewish women taken from Auschwitz, most of whom did not survive a supposed “evacuation” attempt in open railcars following an Allied bombing raid of the worker's barracks outside the Zschopau factory. Kluge would serve as a Unteroffizier in the Schule für Heeresmotorisierung (“school for army motorization”) in Wünsdorf before being released to work for Auto Union as a test driver in 1943. At the close of the war the Zschopau works was seized by Soviet forces. The entire factory was dismantled and transported into the Soviet Union, where it was reconstructed in Ishewsk. An attempt to revive the DKW factory by a worker's collective in 1946 failed and the remains of the factory were converted to production of IFA automobiles and motorcycles by the Soviet leadership, eventually becoming the site of MZ motorcycle production. The operation was referred to as the Industrieverband Fahrzeugbau Werk-DKW until 1951, when the DKW moniker was dropped. The interwar DKW racing department, the surviving works machines, the tooling, and the records were seized and effectively disappeared into the maw of the Soviet Union – it is at this point that the history of DKW's supercharged machines becomes extremely murky. There were apparently a centrifugally-supercharged opposed-piston twin-cylinder racer in development before was broke out in 1939. This remarkable machine would have been an evolution of the 250/350 US, but details on this design and the fate of any prototypes are scant. Only a few sketches and photos remain. 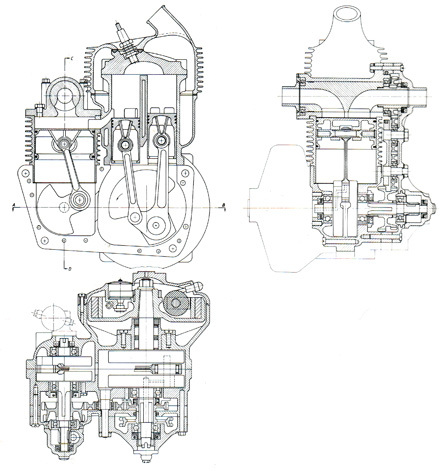 The design featuring twin cylinders with four pistons and geared-together dual crankshafts. Once the Soviets had discovered the plans for these "Gegenläufer" twins, they set about developing the concept and producing several prototypes. 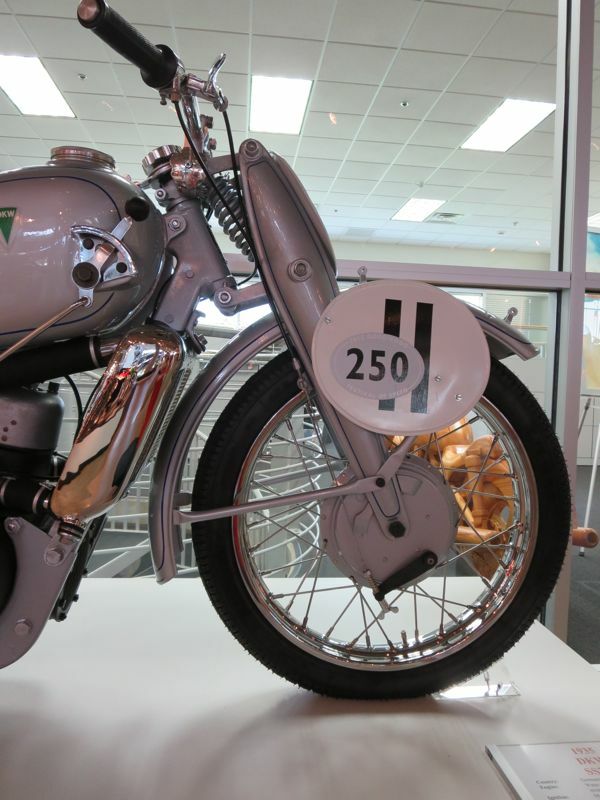 From 1946 to 1949 one 250cc and four 350cc machines were built. IFA-DKW engineers Kurt Bang and Karl Kluge, under the supervision of former DKW race department engineer August Prüssing, were tasked with developing the engine. The IFA-built machines were lost to history after being transported into the Soviet Union, never to be seen again... But one 250cc engine was secretly spirited to the West by racer Kurt Kuhnke and installed in an interwar DKW chassis. 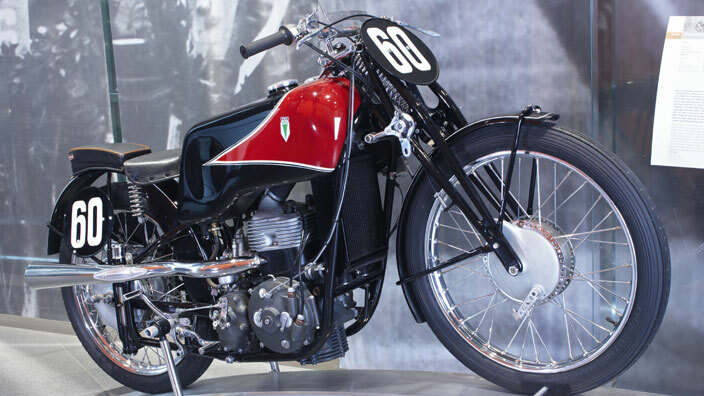 That particular motorcycle, dubbed the Kuhnke Sport 1 (KS-1) was raced in Germany until the 1951 ban on supercharged machines, at which point it disappeared for several decades. It was eventually recovered and restored in 1991, at which point it produced a remarkable 55 hp at 8500 rpm. 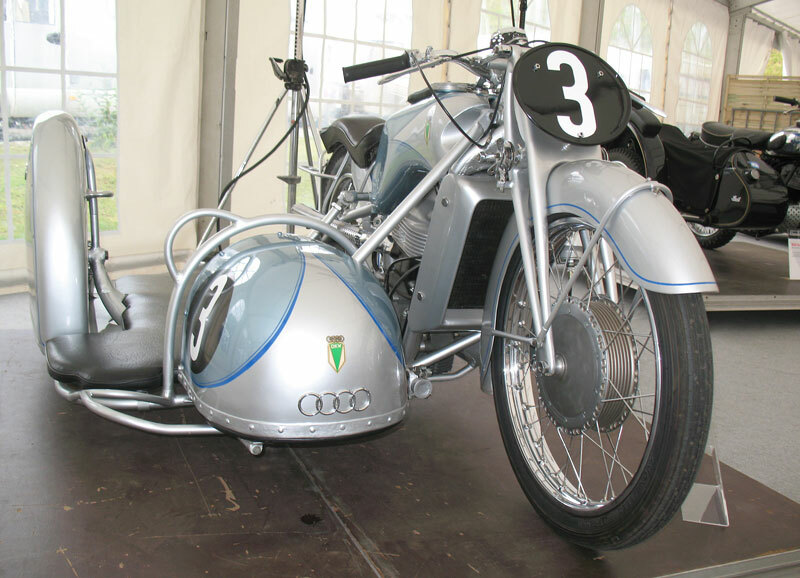 Today the KS-1 resides in the Augustusburg Castle Motorcycle Museum in Augustusburg, Germany. Ewald Kluge was arrested by Soviet forces in 1946 and charged as a Nazi, an accusation reinforced by his party membership since 1937, his ties to the NSKK, and his service at the Wünsdorf motor school. He would be imprisoned in the infamous NKVD Special Camp No. 1 near Mühlberg, setup in the formerly German Stalag IV-B prisoner of war camp. DKW, along with the surviving elements of Auto Union, relocated to Ingolstadt in West Germany. It was there that Auto Union GmbH was formed in 1947, initially servicing military vehicles and producing spares for pre-war machines. The first DKW machine to re-enter production following the war was the humble RT 125. In the austere environment of post-war Germany the simple, cheap and rugged RT became a smash hit. 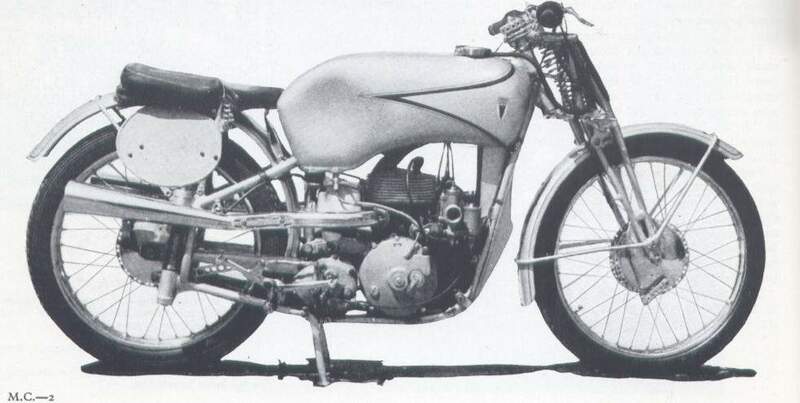 While DKW was producing their RT 125W (“West”) in Ingolstadt, IFA began producing their own RT 125 in Zschopau in 1948. Repatriation agreements following the war led to the design of the RT being produced by numerous companies around the world, including numerous Soviet copies that were being produced in Kovrov (called the K-125), Moscow (M1A Moskva) and Warsaw (SHL 125). Copies were made in the West by BSA (Bantam) and Harley-Davidson (Hummer). The RT was even reverse-engineered and put into production by a certain Japanese musical instrument company in Hamamatsu in 1955 – the YA-1 would be the first product of the Yamaha Motor Company. 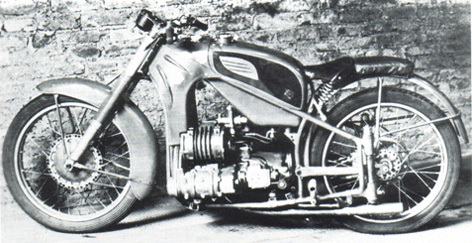 The RT would prove to be one of the most copied motorcycles of all time, and the machine that would establish Schnürle porting as the prototypical two-stroke design. Motorcycle racing restarted in Germany shortly after the end of the war, and interwar racing machines experienced a short renaissance while German companies regained their footing. In 1946 the FIM banned supercharging in motorcycle racing, but in the immediate postwar period Germany operated independently of the FIM with its own set of motorsports regulations that retained the interwar rules. While many of the works DKW machines were lost forever, be it due to destruction of war or their being whisked away into the vast expanses of the USSR, a few survived and were re-entered into competition after 1945. Ewald Kluge was freed by the Soviets in 1949 and immediately returned to racing as a way of making a living in the difficult postwar era, rejoining the Auto-Union team in 1950. He raced Auto-Union liveried DKWs for several years until a crash at a 350 race held at the Nurburgring in 1953 left him seriously injured. He retired from racing after the accident, and passed away due to cancer in 1964 at age 55. 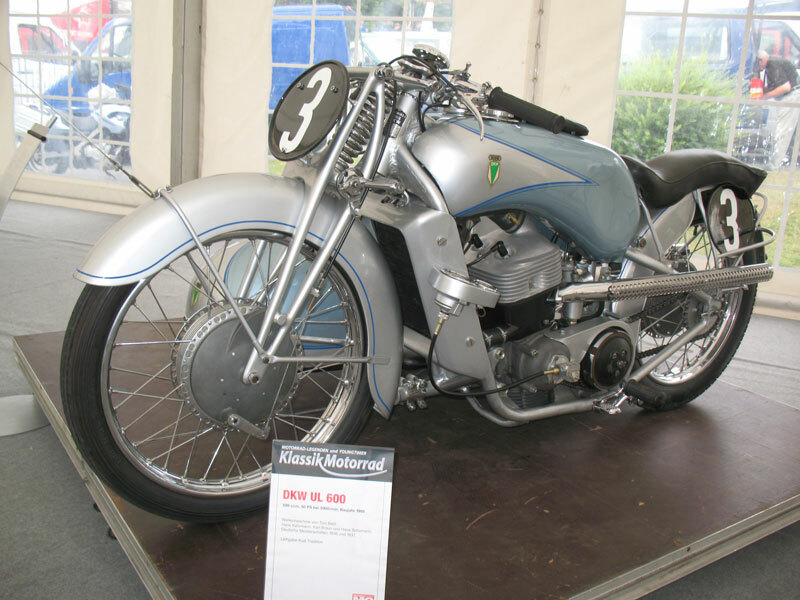 Germany was re-admitted into the FIM in 1951 and thereafter supercharged machines became a relic of an earlier era, never again to be fielded in official competition. DKW renewed their racing program with naturally-aspirated two-strokes, including some well-developed RT 125 racers and a successful series of air-cooled 250 twins and 350 triples. While the Schnürle-ported “Singing Saw” two-strokes were competitive machines by the mid 1950s and eventually eclipsed the specific outputs of their supercharged predecessors, they simply couldn't hold a candle to the technology offered by the remarkable interwar machines. The DKW racing programme would come to an end after the 1956 season. By the end of the 1960s DKW would be no more, its respective motorcycle and automobile arms absorbed, bought out, and merged into oblivion. As the decades pass the accomplishments of the DKW racing department are becoming progressively forgotten and memories of their work increasingly hazy. DKW and the German riders of the interwar period have become the victims of history, their accomplishments tainted by their association with the Nazi push to dominate motorsports competition during the 1930s. The destruction of the war and the subsequent plundering of the DKW factory have all but erased the mark of their once dominant supercharged two-strokes from racing history. The technical details of these singular machines are becoming misunderstood and misrepresented as the decades roll on, making the preservation of their heritage increasingly difficult. 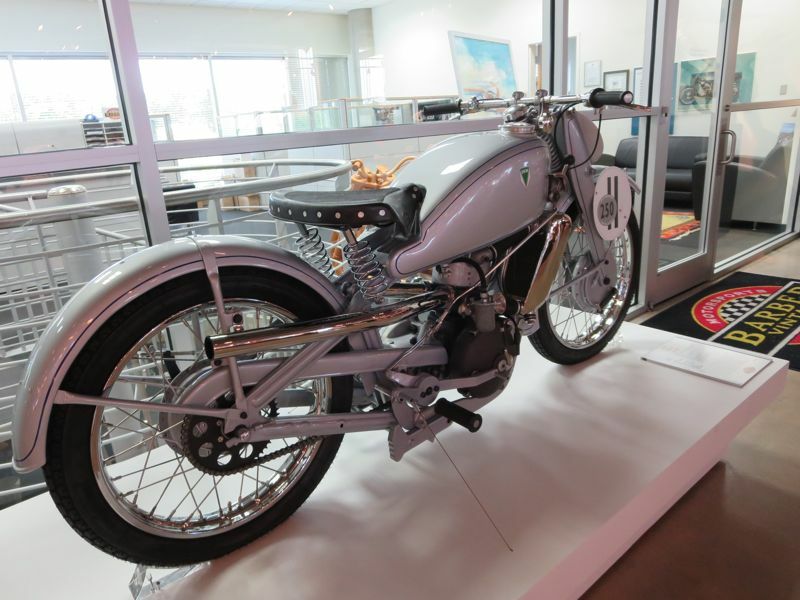 The Volkswagen Audi Group has attempted to preserve their Auto-Union heritage by restoring and maintaining several of interwar DKWs, remanufacturing spares to keep these exceptional motorcycles running for future generations to appreciate. While their efforts are admirable, they are insignificant in the face of decades of neglect, or the deliberate ignorance of those who prefer to trivialize the accomplishments of the Nazi-era German marques. Audi's attempts at preserving their company history is overwhelmed by many years of inertia, and glosses over many of the important (and sometimes unpleasant) details. The DKW Ladepumpe and supercharged split-single two-strokes were some of the most fascinating and technologically advanced motorcycles of their era, and despite their once-dominant position on the European racing stage they are slowly being forgotten. Editor's Note: This topic has been, without a doubt, one of the most difficult subjects I've researched for OddBike to date. The details about the interwar DKWs are scant, convoluted, vague, contradictory, and generally properly screwed up. Even the best sources I was able to find were so full of holes that I had to carefully patch together a rough timeline and technical history to try and make sense of the development of these machines. I mention this because I am certain that I am getting some of these details wrong, and I welcome anyone who knows better to please share their knowledge. I'd like my humble attempt at preserving and sharing the history of these machines to be the impetus to dig up some additional information and correct years of misinformation. If you have anything to share, be it fact or conjecture, please feel free to leave your comments below. 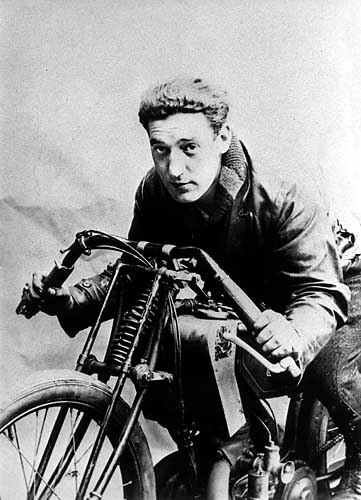 Leo Steinweg started riding for DKW in 1924 on the ARE and ORE series of machines, and ran a motorcycle and bicycle repair shop in Münster. His racing career ended in 1934 when the renewal of his racing license required proof of Aryan heritage – Jews were barred from renewing, a ban which was extended to all driver's licenses and vehicle registrations in 1938. Steinweg fled to the Netherlands in 1938 and lived in hiding with his Catholic wife Emmy Herzog until 1942, when he was captured and sent to a series of concentration camps, including Auschwitz. He died in Flossenburg in early 1945. Emmy Herzog survived the war and published a memoir of her life with Steinweg in 2004. I always loved the Kompressor BMW's but those supercharged Deeks make them look like simple mecano set! Makes for a fascinating "what if" premise. Also good to have you back posting. This has to be my favourite motorcycle site on the net. Keep up the good work! Outstanding work. A fantastic reading of the DKW story! One of the most technically interesting articles on motorcycle history I have ever read. Thank you for your great history. I don't really understand the split piston, but the rest of it is great! I especially appreciated the opposed piston supercharged 2 stroke gasoline motorcycle engine. I thought the opposed pistons were found only on aircraft engines until Napier after WW2. Those germans! I believe there is a future for 2 stroke supercharged engines when using direct fuel injection.With supercharging the intake mixture can bypass the crankcase. The lubrication stays in the crankcase while the supercharged air flushes the cylinder, afterburning exhaust gases and with fuel injection it is possible to adjust precise amounts of fuel at the right moment, i,e. before pressure in the cylinder requires expensive high pressure injection pumps.High power to weight ratios are possible at lower cost than with a 4 stroke engine. I agree with anonymous. The output potential from a supercharged opposed piston engine with a 15-25 degree phase lag is very high. Add in direct injection to prevent any possible overscavenging, and its fuel conunption should be very good for its power output. Now, if only it were possible to reduce oil burning caused by oil leaking past the cylinder ports, this would be a real winner. I understand that Achates power is working on this problem. I really hope they are successful. This DKW opposite piston system was reused in the 70's by french bike builder Motobecane in 99z model, a 50cc with a load of torque. I know you have spent an immense amount of time on this and it is appreciated. I knew a very small part of the story, but this clears up a lot. I am a 2 stroke kind of fool and it would have really been great to have been part of this history. It is a shame how the folks that really know the story are gone and the rest don't care. Thank You! 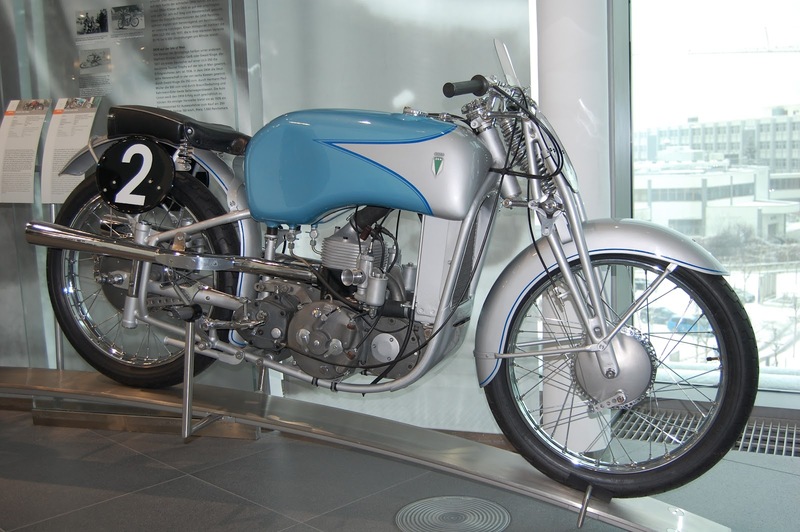 As a follower of the MZ racers in the 50's and 60's with Walter Kaarden's great work under trying circumstances, it is interesting to note the various key components that the pre-war DKW's experimenters tried. Disk and reed valves and rear facing exhausts. 2012-2019 All content copyright Jason Cormier and respective copyright holders. Travel theme. Powered by Blogger.